Powerful Fijian loose forward Pita Gus Sowakula has been a great addition to the Gallagher Chiefs this season, both on and off the field. The 23-year old came into the team as an injury replacement player and has hit the ground running with excellent performances. 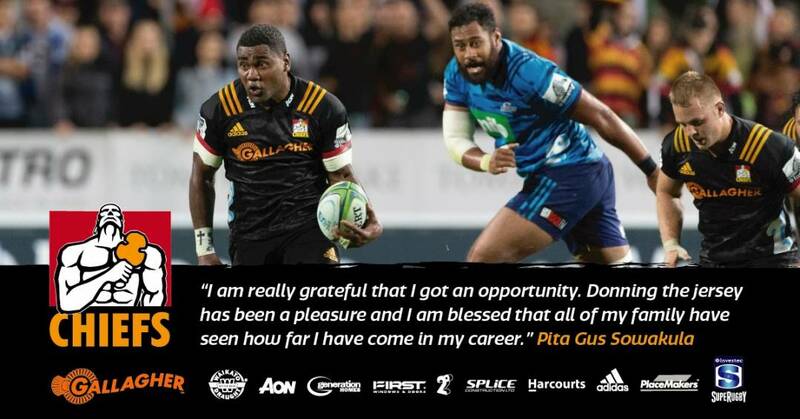 Pita Gus displayed great x-factor off the bench when he made his Gallagher Chiefs debut against the Highlanders which he notes as a highlight. Outside of rugby, Pita Gus has represented Fiji in Basketball before putting his focus on rugby, and has worked as a Chef which he hopes to continue after his rugby career. The opportunity to play Super Rugby has been noteworthy for Sowakula. And with the Gallagher Chiefs travelling to Fiji to take on the Highlanders this weekend, the Sowakula family are making sure they’re there in Suva to show their support! Off the field, Pita Gus has lead the team in special Fijian hymns which they sing together, which has been a really special connection for him. The Gallagher Chiefs have travelled to Suva, Fiji where we are being hosted by the Highlanders in the first match following the June International break, kicking off this Saturday at 7:35pm NZ time. This will be the third time the team have played in Fiji, after games against the Crusaders in the previous two years. The team is looking forward to playing in front of the enormously passionate Fijian crowd. You can watch the game on Sky Sport 1 this Saturday and the team will be named tomorrow (Thursday 28 June) at 4pm.